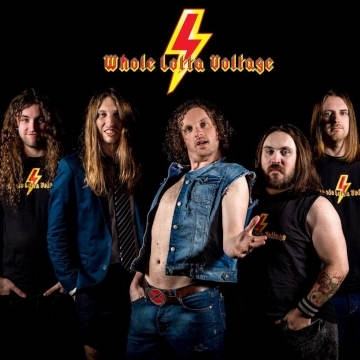 Whole Lotta Voltage deliver the most complete and authentic reproduction of AC/DC's sound and stage performance in Ireland. The Whole Lotta Voltage live show has gained notoriety all over the country with its attention to detail, whirlwind energy and stunning musical accuracy. Established in the year 2010 and based in Dublin, Whole Lotta Voltage comprise of 5 highly talented and experienced musicians from 3 different countries who share a passion for the greatest rock band on earth...AC/DC. The Lead Singer delivers a powerful, whiskey drenched vocal combination of both Bon Scott and Brian Johnson, giving fans the best of both at every Whole Lotta Voltage show. Rhythm Guitar, Drums and Bass are the driving force behind the famous AC/DC rhythmic freight train. Last but not least, our ultimate Angus Young impersonator offers the most frantic, high-energy stage performance, while delivering note for note perfection on every famous AC/DC riff. Whole Lotta Voltage emulates the feel, power and pure essence of AC/DC and proves it with every show they do. Ireland's longest running and most widely recognised definitive AC/DC tribute.